Castle Acre Village01553 763044work VillageThe village of Castle Acre lies on the River Nar, 15 miles east of King’s Lynn. It is best known today for the twin ruins of Castle Acre Castle and Castle Acre Priory, which lie immediately to the east and west of the village respectively. Both were founded soon after the Norman Conquest by William de Warenne the first Earl of Surrey. The castle was first built as a country house, but during the first half of the 12th-century, more disturbed conditions prompted its progressive conversion into a strong keep, further defended by stone walls and an immense system of ditched earthworks. Still impressively visible, these are perhaps the finest village earthworks in England. Castle Acre Priory was inspired by the monastery at Cluny in France and was home to a community of monks until 1537, when Henry VIII disbanded all monastic houses. The priory's ruins span seven centuries and include a beautiful 12th-century church with an elaborately decorated west front, still rising to its full height, a 15th-century gatehouse and a porch, and prior's lodging still fit to live in. At its heyday, Castle Acre played an important role in the affairs of the State, with many visits from royalty. Castle Acre itself was once a fortified town and still possesses one of its gates, the Bailey Gate. When first established, Castle Acre was one of the finest examples of Norman town planning in the country, and much of this can still be seen. As well as its historic sites, the village offers a pub, The Ostrich and a selection of tearooms and speciality/gift shops. 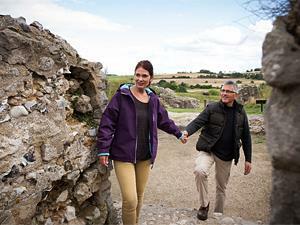 There is also a programme of guided walks exploring the history of the village. Beautiful walks from the village can be enjoyed along the Nar Valley Way as well as the Peddars Way which stretches north toward the coast near Hunstanton and south towards Thetford. The village of Castle Acre lies on the River Nar, 15 miles east of King’s Lynn. It is best known today for the twin ruins of Castle Acre Castle and Castle Acre Priory, which lie immediately to the east and west of the village respectively. Both were founded soon after the Norman Conquest by William de Warenne the first Earl of Surrey. Close to Castle Acre is the popular West Acre Theatre and also nearby are the beautiful West Acre walled gardens.